It is no wonder that in the 1839 The Joiner and Cabinet Maker, mentions that many some Cabinet shops in the nineteenth century England did not allow a grindstone on the premises. And why you might ask, well the masters of the shops didn’t want their tools needlessly ground away, nor their workman wasting time at the grindstone. I am convinced that if modern grinding and sharpening equipment and mentality had been available in the nineteenth century that we wouldn’t have any useful tools today, they would have been repeatedly and unnecessarily ground to oblivion. Modern wood turners seem to have their grinders running right next to their lathes, this I don’t understand. As it is many old tools are being over ground and over sharpened and probably get more of their metal ground away in just a few years than in the previous 100 years. This is not to say that our ancestors didn’t over sharpen, I have seen more than one plane blade that was ground up to the piercing for the cap iron. Modern woodworkers are overzealous when it comes to grinding and sharpening, trying every new ‘system’ that comes around. Changing the angle on the chisel or plane iron to match the wood they are using at one point and altering the angle for other woods, seems to me a bit excessive. Also in the nineteenth century when a craftsman was grinding or sharpening they were not making money and as most worked by the piece, time is money. Banning the grindstone saves both time wasted in endless grinding and money saved by preserving the metal on the tools, this idea should be reconsidered. If you need tools with different angles on their cutting edge, then you should have tools dedicated to that purpose and properly ground and sharpened, instead of regrinding and re-sharpening the tool with every change in activity. Find the proper angle stick with it and save the tools. This is of special importance if you use old tools [they aren’t making them anymore]. I do have a grindstone, 15 inch diameter, two inches wide and on a direct drive to the hand crank. After I clean off the cobwebs and dust, I use this to initially grind the tool to the proper angle and the tool almost never sees the grindstone again. I then use a course Washita stone to work the edge to a burr then move on to English slate for the final hone. I then strop on leather and am ready for work. I use my tools until I determine that they are dull and not performing well. I then take them to the slate and touch up the edge, then strop. I may have to go the coarser stone if necessary but never back to the grindstone. I never spend more than a couple of minutes at this process. I don’t use any ‘secondary’ bevel and of course the ‘back bevel’ should never be done as it is a bad and lazy practice. Do your tools a favor and quit grinding and sharpening them to excess. All of that work isn’t necessary and while you may enjoy the sharpening process, [use it on new tools not old ones] it takes time away from woodworking. Most of my tools are laid steel blades [hard cast steel forge welded to soft wrought iron, which does not harden], so my sharpening is much easier. I only have a thin veneer of hard steel to sharpen and the wrought iron abrades away quickly. I do have a few solid steel carving tools and they take longer to sharpen. There comes a time in the life of every woodworker when work has to be done. I do wish occasionally that I had a grinder though for taking out the occasional nick or creating an angle. In the meantime, I am careful not to nick my tools and get exceptional life from my blades. What type of English slate is it you use? Agreed with the massive waste of tool life overgrinding causes, very good point. I only use the grinder if I want to introduce a renewed hollow grind on the bevel. Otherwise once the tool has been sharpened initially and except for the occasional repair, the edge will never feel the grinder. Shout it to the rafters, brother! I’m glad you’ve said these things. I’m sometimes embarrassed that I don’t spend half my shop time sharpening tools. It’s become the religion of woodworking, I’m afraid. My grinder resides on a shelf under a table. I use water stones and a strop myself, mostly using a fine stone and strop to touch up tools occasionally. I’m sure I’d be considered a slackard by most of modern woodworkers. How right you are. 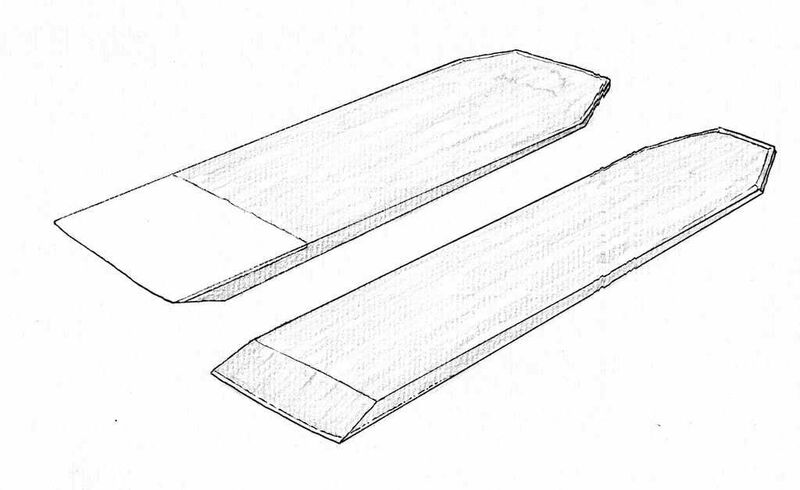 Once I have a good angle on a blade (I do use a grinder) I use at most a fine oilstone and generally just a leather strop to hone the edge every now and then to keep it keen. I probably do that a bit too much, but I loose very little steel with a strop. Wanted to see if anyone was still reading, huh? What better way than to promulgate a sharpening method that doesn’t match today’s fury? … even calling back bevels “bad and lazy.” Uh-oh! Come now, Mr. Shepherd. You don’t have a Scanning Electron Microscope for inspecting your blades? For shame. Get with it man! Get those tools really sharp! Ha! Last week I posted a 2-part post and video on my blog about hand-held sharpening using a very simple method I read about on the UK forums (where there seemed to be a lot of hard feelings over it). Judging by the number of page hits and video views, sharpening is a very popular subject. It does turn into an end in itself. I just want it to be fast and effective and get back to the wood. Plus I’m trying to be true to the spirit of 19th century woodworking, without all the gadgets (I feel guilty just using new Norton oilstones, which are probably a lot better than the stones of that era). If they could do it, I ought to be able to learn how, too. Feel free to join in – though be warned they are an irritable and opinionated lot! Another great post! I remarked on this lack of grindstone the last time I was in Williamsburg and Mack Headley replied with a quip about “I don’t use the things”. Their methods appear to be the same as yours and it was great to hear this from another source. What’s funny is the grind stones that you do see are often back in the corner of the property exposed to the elements which for at least half of the year in Williamsburg would seem like punishment to be completed as quickly as possible. Whether it be 5 degrees or 105 I don’t think anyone is cranking that wheel for too long. Hear! Hear! Piffle and fiddlesticks on this modern focus on grinding. I’ve used an old hand powered grinder with a white wheel of some unknown grit and a set of ceramic stones. That’s about it. I don’t whet to a razor edge, mostly because the silly thing breaks off, roughens and needs to be re-sharpened almost as soon as I approach a piece of wood. Of course, I am not working in rosewoods, wenge or any of those nasty hard as nails woods and if I did, I would be minded to use power tools rather than break my back trying to dimension them. But I don’t use them. Give me butternut, poplar, cherry, maple, pine and the occasional oak. So why the OCD approach to grinding and whetting? I once visited the North Bennett Street School. There was a young woman there, in the Furniture program, who was working away on an oilstone with a poor benighted plane blade. The instructor mentioned, quite proudly, that she had been doing nothing but sharpening for the past three days and would continue to do so for at least a week until she KNEW HOW TO SHARPEN. This, before she would be allowed to put blade to wood. Feh! It looks to me that both sides are pretty grumpy. The folks who like to make a big deal about sharpening, an end in itself, and those who are dismissive of doing more than the bare minimum and scoff at paying keen attention to edges. David Charlesworth. I don’t think it is over-sharpening to go through the four to five minute process a couple of times in a working day if you’re working for hours pushing planes. It saves your body a great deal of stress having the edges as sharp as possible and the work is more enjoyable. The timeouts at the sharpening station are a beneficial pause, I find. Me, grumpy! Hah! never! Feh! Anyhow, I believe the point is that getting to a keen edge is not as big a deal as people make it out to be. If you can touch up the edge in four or five minutes, you know what you are doing. It’s the processes that focus on extended work to achieve the Perfect Edge that we take issue with. Wood is not a stable homogeneous product. Grain changes, late wood v early wood and so on. This focus on precise blade angles is all bupkis. When I’m planing, I adjust the angle of the plane minutely until I find the angle of approach that suits that particular piece of wood. If needed. If your blade is 34 degrees instead of 35 it won’t make any difference. The primary need for powered or hand powered grinders is to form the initial edge profile. After that, it should be quite a while before you need to use the grinder once again. I use a secondary bevel and continue to touch it up until it’s almost gone. Although all that has been said in the classic books is not necessarily The Best Way, some things hold true. Sharpening is one of them. Get the profile and get to work. Touch up as needed and don’t re-grind until you absolutely have to. Briefly, I’ve set up a jig-based system that gets me very nearly the same angle for each sharpening and honing the entire bevel of thin (ie modern, not tapered) blades but puts a polished microbevel (honed with Autosol on glass) a degree of two higher than the standard 30deg. Hence I find no need to grind Bailey pattern plane blades at all. And of course they main benefit of not using a grindstone is that it will deter you from allowing your tools to get into such bad shape that they need grinding. This is a very good thing IMHO! I have to be the contrarian here. There is a lot of talk about sharpening on the internet, and how much one should sharpen their tools, but it is not often actually done. I have bought a lot of used tools – be they Lie Nielsens or a Carpenter (the maker, not the trade) fore plane. I have not once encountered one that has been “oversharpened” via a modern method, rather in most cases, the newer ones look like they’ve seen stones only and they were never properly sharpened to begin with, the original factory grind is still there. Quite often, the older tools (>100) look like the ones that have been subject to a grinding wheel and given far too much camber with coarse marks going all the way to the edge. Maybe they were owned by a carpenter. Should someone use a modern method of sharpening, like a tormek, and do it properly, they will not go through a set of chisels or a plane blade in their lifetime, and from what I’ve seen, most new hobbyists are on that track, and I would be included, even though I would be in your group of “oversharpeners”, because I chase the edge back to almost ground off every 5 or 6 sharpenings, and I sharpen mid project if I feel the need – whether the tools are japanese or western. Should anyone be worried that someone will follow modern methods and grind and hone away a chisel with a 1 micron stone? I don’t think so. This does not include turners, but there is no reason to worry about what turners are doing hogging away tools on a white wheel – they aren’t using old tools, anyway. I hope no new woodworkers would read the blog and conclude that sharpness isn’t important, especially if they are intending to do tidy work with a smoother and leave a surface unfinished or finished only with wax. The ability to achieve long-wearing extremely keen edges is there, use it. If anything, people are too afraid to use a grinder at all. Thank you all for your comments, especially David for his contrary view, always like someone keeping my feet to the fire. And this has got some truck around the internet as well. I did make a small correction in the text as someone pointed out I substituted ‘many’ for ‘some’. The point is still the same. A fun topic which I will continue. It’s great to see traditional skills still being practiced. Great blog and some really useful insights. great website, really impressed by your knowledge and dedication to your craft.